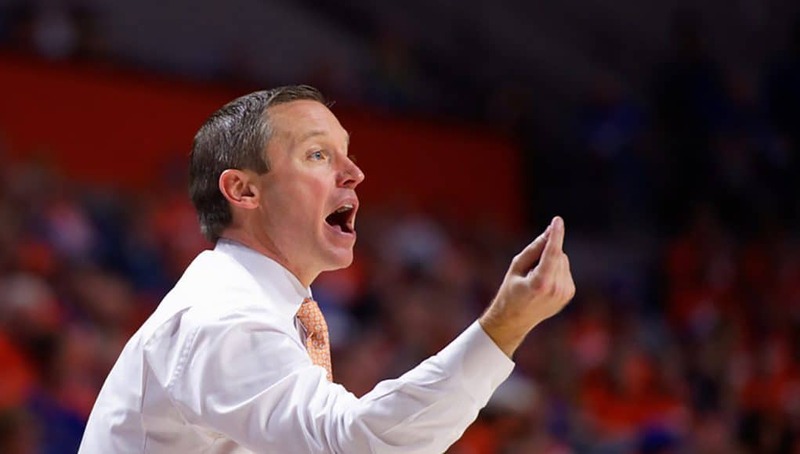 It required 5 minutes of extra basketball to decide but after a heart-pumping night of basketball the Florida Gators won an overtime thriller against the Ole Miss Rebels by a score of 90-86. With Ole Miss up 76-73 will 8 seconds left in regulation it was looking pretty dire for the home Gators but KeVaughn Allen dribbled the ball up the right side of the court, pulled up from three with confidence, and tied the ballgame to the delight of the O’Dome faithful. In overtime a 7-0 run off buckets from KeVaughn Allen and Andrew Nembhard dug a hole deep enough that Ole Miss couldn’t climb out of it despite a tremendous effort that saw them chisel things down to a one-possession game in the final minute. Ultimately Andrew Nembhard and Noah Locke were able to convert the much-needed free throws when Ole Miss was forced to foul and that lead to the Florida victory. 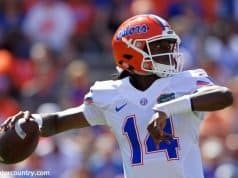 With this 4-point win the Gators got their first win in a game decided by 5 points or less, an area that has been a struggle for the team this year as they were 0-5 in those games up until this point. Hopefully this will get the confidence going for a major matchup with Kentucky on Saturday. Struggles on offense have defined the Gators season so far but tonight they may have had a bit of a breakthrough shooting 49.2% from the field, 42.3% from three, and 77.3% from the charity stripe. Noah Locke (22 points on 7-13 shooting) and Keyontae Johnson (a career high 15 points on 7-11 shooting) were both extremely efficient and KeVaughn Allen had some key buckets on his way to 21 points going 6-19. Ole Miss isn’t a great defensive team so it wasn’t like the Gators were putting up points on a juggernaut but it was still nice for them to hang 90 points (albeit in an overtime game), their second highest point total of the season and the highest they’ve put up against a power conference team. Though they got enough key stops to win the game the Gators struggled defensively in this one, especially at containing the drive. Terence Davis (26 points, 12 rebounds, 5 assists), Breein Tyree (20 points), KJ Buffen (17 points) and Devontae Shuler (9 points) all took their turns isolating against Florida’s guards and they were getting to the hoop at will. 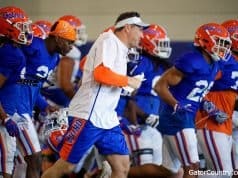 It was a wise coaching move by Kermit Davis to try to go one on one as the Gators are really strong defending as a unit but don’t have a ton of individual shutdown players. By turning it into an isolation game the Rebels got a lot of open looks and it very nearly won them the game tonight. With Florida having to play so small due to the injury situation rebounding has become a problem and it was definitely an issue tonight. Though Ole Miss hasn’t been great on the glass this year they had a field day against the Gators going +14 on the boards with 15 offensive rebounds. There isn’t a lot that Florida can do at this point when it comes to improving their rebounding but the inability to finish defensive possessions with a rebound is going to sting them a few more times before this season is done if I had to bet. Florida had not one, not two, but three injury scares tonight that kept fans biting their nails to see the players would return after heading to the locker room. Luckily every single one did, but I’ll be interested to see if there are any lingering issues. KeVaughn Allen had a knee-on-knee collision early in the first half, something that always looks scary, but after hobbling off he returned relatively soon. Then, in hustling for a loose ball Dontay Bassett got his head sandwiched between an Ole Miss player and the hardwood, something that looked incredibly dangerous and painful to me. Though I was nearly certain he’d be put in concussion protocol and made unable to return he got back to the bench and played another shift. Lastly, one defensive possession after a monster dunk off an inbounds play Keyontae Johnson limped to the bench with a tweaked ankle, another injury that had my nerves tingling. Fortunately, like his teammates he seemed to be alright and played out the rest of the game until he fouled out in overtime. These were three scary plays but luckily every player returned. In a lot of ways I thought the Gators stole this one as they did not defend or rebound at a level that would normally win this game. But let me say this…man does it ever feel good to steal a game. The Gators have been on the wrong side of so many tight games this year and winning one that required a tough 3-pointer to tie in the final moments and then a hard-fought overtime period must feel amazing for this team. Putting up some points in an efficient manor can’t hurt either, and overall this game could be a big boost for the Gators. 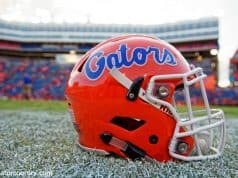 Previous articleWhen will Florida football next compete for a national title?